The Speedmaster is not only one of horology’s best known models and still in production more 60 years after its launch but the original models with the so called “Broad Arrow” hands have become amongst the most coveted sports watches of the era. The first generation model, reference CK 2915 launched in 1957, is considered by collectors as “the grail” for a number of reasons. In terms of design, it was the first chronograph to feature a tachymeter scale (or, as Omega called it at the time, the Tacho-productometer scale) on the bezel, rather than on the dial. In terms of movements, Omega did not go for a brand new caliber, turning instead to caliber 321, an extremely robust and reliable column-wheel chronograph, which it recognized as the best available option for its new Speedmaster. In production only between 1957 and 1959, the reference 2915 was produced in three different iterations: -1, -2, and -3. CK2915-1 and -2 are the very first – and most collectible - Speedmaster models. They have unique differences from all later generations of Speedmasters, most notably in their dial graphics and important elements of case design. The large “Broad Arrow” minute and hour hands are one such trait, but also the metal bezel - rather than a bezel with black insert - and slightly different dial graphics, distinguishable by the oval “O” of Omega. This oval will later become perfectly round. 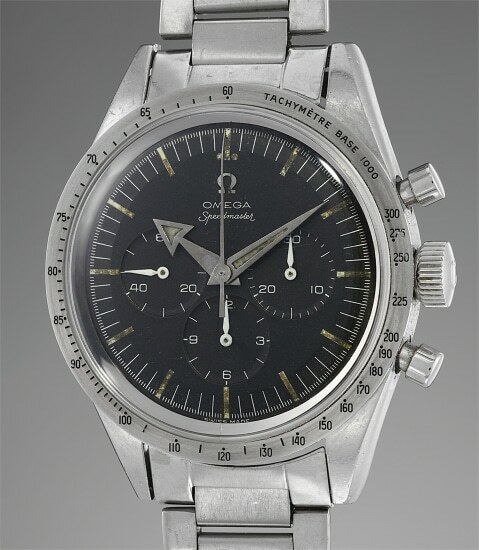 Also the case has details which would later be abandoned, such as the “Speedmaster” designation engraved on the slanted edge of the caseback rather than on the center. The present reference 2915-2 was originally made for the French market and was found by the current owner in France with an incorrect bezel. Omega was tasked to make a bezel specially for this watch as indicated in the Omega invoice that accompanies it. In overall appealing condition and offered with its original semi-expandable bracelet with "6" end links the present watch offers a wonderful value for the collector.